And through the dark of winters nights, a glowing light we’ll take. This Sunday our family of five will walk slowly in song with our lanterns lit around a grove of trees after sundown for Martinmas. Together we will walk and sing honoring the new season of darkness with candles flickering and aglow with sentiments of warmth, compassion, togetherness, and hope. St. Martin is a festival the Waldorf community we are a part of celebrates each year, traditionally on or around November 11th, in the last stretch of autumn before winter arrives. It’s a celebration of compassion and light – a festival that connects us to the rhythms of nature as the ties of our community are nourished and strengthened. Story of St. Martin is one of action and kindness for those in need. He is the patron saint of the marginalized who brought warmth and light to the outcasts who lived with very little, both in terms of belonging and respect. This festival is a way of honoring his life of service and the message of goodness he spread in the world. The colorful lanterns we’ve made symbolize the warmth in our hearts and the glow represents how we can share that with others. As we draw nearer and nearer to the Solstice, we are invited to draw inward to light our own candles so they may shine outwardly in a dark world that could use some brightening. We will walk meditatively together (babies too!) holding and sharing our handmade lanterns, each one unique and beautiful, just like each the lights each of us carry within the inner landscape of our souls. 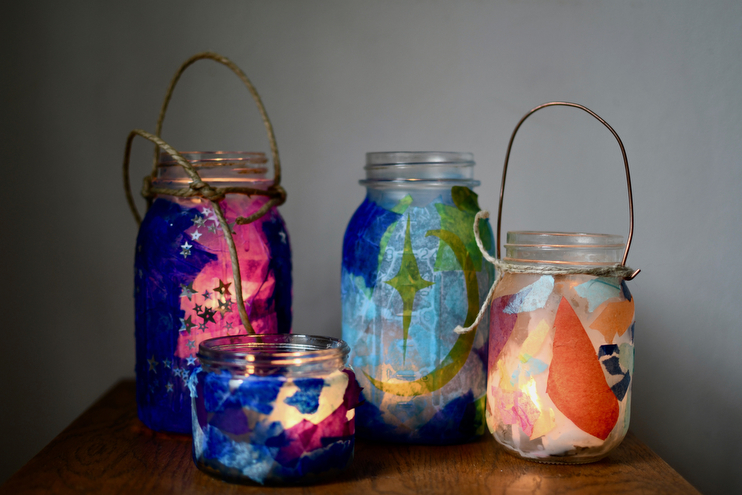 Below is a simple tutorial how you and your little ones can make lanterns of your own. And if you don’t happen to follow Waldorf ways, these make for beautiful and meaningful decorations to have around your home this winter. 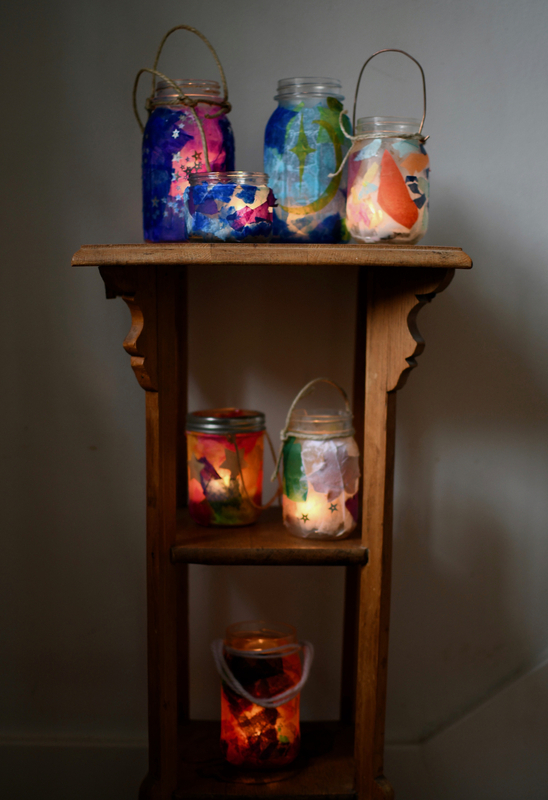 These are lanterns our family has made over the past three years, and today we’ll be making some more! Dilute the glue by mixing it with equal parts water in a small bowl. Tear, rip, or cut the tissue paper making shapes or a design. Little ones love this part. 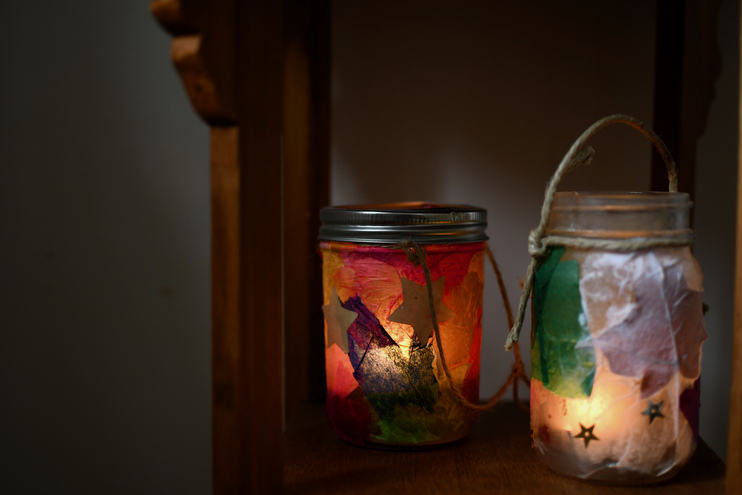 Lay tissue paper on the outside of the glass jar, and paint the diluted glue over it. It should stick immediately, but be mindful that dark colors will run! Once the entire jar is covered with tissue paper, set aside to dry overnight. Once dried, use yarn, wire, or jute string to make a handle on the top of the jar under the lip where the lid goes. You can secure it with a glue gun, or not. Pop a tea light in, and you’re set. With a recent shooting here in a Marin County just 3 days ago & another down in southern CA last night I want to light up the sadness in our hearts with warmth and glow and the magic that is within all of us. We’ve just celebrated this with our school here in Switzerland, and carved lanterns from turnips of all things! The kindergarteners all meet to walk through the village, singing as they go, and we finished at the school with more songs, hot cider and little sausages. It’s beautiful!